You are currently viewing all posts tagged with quote. This past summer a 13-year-old girl shattered my optimism for the future. Teens say they’d basically do anything to avoid searching for answers to their problems outside of Instagram. Unlike threads, web pages don’t follow any standardized format, and teens say that navigating the open web, especially sites with ads and pop-ups, was a frustrating waste of time. Teens say that another benefit of threads is that you don’t have to waste time searching around – the information is delivered to you based on your interests and whom you follow – and that threads feel more trustworthy than search engines. I’m not sure what sort of dystopic future we’re in for if we manage to raise a generation of people who are intimidated by a paragraph, but I suppose we’ll find out. This post was published on 2018-12-28 . It was tagged with micro, quote, books. I was reminded recently of John Michael Greer's comments on distributed communications. What would a viable long-distance communications network in the age of peak oil look like? To begin with, it would use the airwaves rather than land lines, to minimize infrastructure, and its energy needs would be modest enough to be met by local renewable sources. It would take the form of a decentralized network of self-supporting and self-managing stations sharing common standards and operating procedures. It would use a diverse mix of communications modalities, so that operators could climb down the technological ladder as needed, from computerized data transfer all the way to equipment that could be built locally with hand tools. It would have its own subculture, of course, in which technical knowledge and practical expertise would be rewarded, encouraged, and fostered in newcomers. Finally, it would take a particular interest in emergency communications, so that operators could respond to disruptions and disasters with effective workarounds at times when having even the most basic communications net in place could save many lives. The interesting thing, of course, is that a network that fills exactly these specifications already exists, in the form of amateur radio. This post was published on 2018-12-24 . It was tagged with micro, radio, quote. In an interview with the Economist, Adam Curtis describes what he sees as our static, machine haunted world. This is the genius of what happened with computer networks. Using feedback loops, pattern matching and pattern recognition, those systems can understand us quite simply. That we are far more similar to each other than we might think, that my desire for an iPhone as a way of expressing my identity is mirrored by millions of other people who feel exactly the same. We’re not actually that individualistic. We’re very similar to each other and computers know that dirty secret. But because we feel like we’re in control when we hold the magic screen, it allows us to feel like we’re still individuals. And that’s a wonderful way of managing the world. Its downside is that it’s a static world. It doesn’t have any vision of the future because the way it works is by constantly monitoring what you did yesterday and the day before, and the day before that. And monitoring what I did yesterday and the day before and the day before that and doing the same to billions of other people. And then looking at patterns and then saying: “If you liked that, you’ll like this”. They’re constantly playing back to you the ghosts of your own behaviour. We live in a modern ghost story. We are haunted by our past behaviour played back to us through the machines in its comparison to millions of other people’s behaviour. We are guided and nudged and shaped by that. It’s benign in a way and it’s an alternative to the old kind of politics. But it locks us into a static world because it’s always looking to the past. It can never imagine something new. It can’t imagine a future that hasn’t already existed. And it’s led to a sense of atrophy and repetition. It’s “Groundhog Day”. And because it doesn’t allow mass politics to challenge power, it has allowed corruption to carry on without it really being challenged properly. This post was published on 2018-12-12 . It was tagged with micro, quote. James Stejskal's article from American Rifleman provides an overview of the arms used by T.E. Lawrence and the Arab Revolt. The article is an extract from the author’s military history of Lawrence and his legacy, which I’ve added to my reading list. I was unaware that they made use of technicals, predating Bagnold and his self-described “piracy on the high desert”. Lawrence had a talent for employing the Great War’s new technologies: semi-automatic pistols, airplanes, electric detonators, machine guns and motorcars. The equipment used by T.E. Lawrence and his colleagues against the Turks was innovative, as was his untraditional approach to the employment of intelligence, aerial reconnaissance and mobile gun platforms. His methodologies were game-changers and would heavily influence what would later be known as special operations in the British military, not to mention guerrilla leaders such as Mao Zedong and Võ Nguyên Giáp. This post was published on 2018-12-11 . It was tagged with micro, quote, conflict. I try to structure my life to optimize sleep. Piotr Wozniak, the author of spaced repetition software SuperMemo, has a lengthy treatise on sleep, based on his long running research regarding memory and learning. His disk and RAM metaphor is a useful way to think about the relationship between knowledge and sleep. A metaphor can help understand the role of sleep and why alarm clocks are bad. We can compare the brain and its NREM-REM sleep cycles to an ordinary PC. During the day, while learning and experiencing new things, you store your new data in RAM memory. During the night, while first in NREM, you write the data down to the hard disk. During REM, which follows NREM in the night, you do the disk defragmentation, i.e. you organize data, sort them, build new connections, etc. Overnight, you repeat the write-and-defragment cycle until all RAM data is neatly written to the disk (for long-term use), and your RAM is clear and ready for a new day of learning. Upon waking up, you reboot the computer. If you reboot early with the use of an alarm clock, you often leave your disk fragmented. Your data access is slow, and your thinking is confused. Even worse, some of the data may not even get written to the disk. It is as if you have never stored it in RAM in the first place. In conclusion, if you use an alarm clock, you endanger your data. This post was published on 2018-11-21 . It was tagged with micro, sleep, quote. The Atlantic uses the opening scene of Blade Runner 2049 as inspiration for an exploration of the near-future rural countryside. The author weaves together scenes of death and catastrophe with iconic imagery of humanity’s attempts to keep the dystopia at bay: fields of heliostat mirrors, a green wall across the breadth of the Sahara, cloud-seeding chambers high in the Himalaya, and Almería’s tapestry of plastic greenhouses. This post was published on 2018-11-20 . It was tagged with micro, quote. I few months ago I read Marie Kondo’s The Life-Changing Magic of Tidying Up. It’s not the sort of book that usually finds its way into my library, but it had been recommended periodically by a handful of different people over a year or two. I found the book to be disappointing. Many of the pages struck me as fluff – clutter, you might say, which is ironic given its subject. Edited down to a pamphlet of a dozen pages, or perhaps a short series of blog posts, it could be enjoyable, but there isn’t enough content for a book. The one thing I did take away from the book is folding. Kondo recommends folding things such that they stand on edge in the drawer rather then being stacked on top of each other. This way all the contents of the drawer are visible at once, instead of only the things on the top of a stack. The goal should be to organize the contents so that you can see where every item is at a glance, just as you can see the spines of the books on your bookshelves. The key is to store things standing up rather than laid flat… The number of folds should be adjusted so that the folded clothing when standing on edge fits the height of the drawer. This is the basic principle that will ultimately allow your clothes to be stacked on edge, side by side, so that when you pull open your drawer you can see the edge of every item inside. This made sense to me. Unfortunately, the combination of having a walk-in closet in my apartment and not owning much in the way of furniture means I don’t actually fold many of my clothes. Most things end up being hanged (a Kondo no-no). I fold some less-seasonally appropriate clothing for storage in Transport Cubes (another Kondo no-no) and I fold larger things like sheets and towels for storage in underbed boxes, but neither of those really lend themselves to this method of folding. One of the few pieces of furniture I do find useful enough to own is a filing cabinet. I keep socks in the large bottom drawer and underwear in the middle drawer. The top drawer holds an assortment of bandannas, hand wraps, and some seasonally appropriate head and neck wear. After reading the book, I dumped out all the socks and underwear and folded them to Kondo’s specifications. It is definitely an improvement. Previously I rolled socks together, which is not very efficient in terms of volume (and disrespectful to the sock, according to Kondo). The drawer was overfilling. 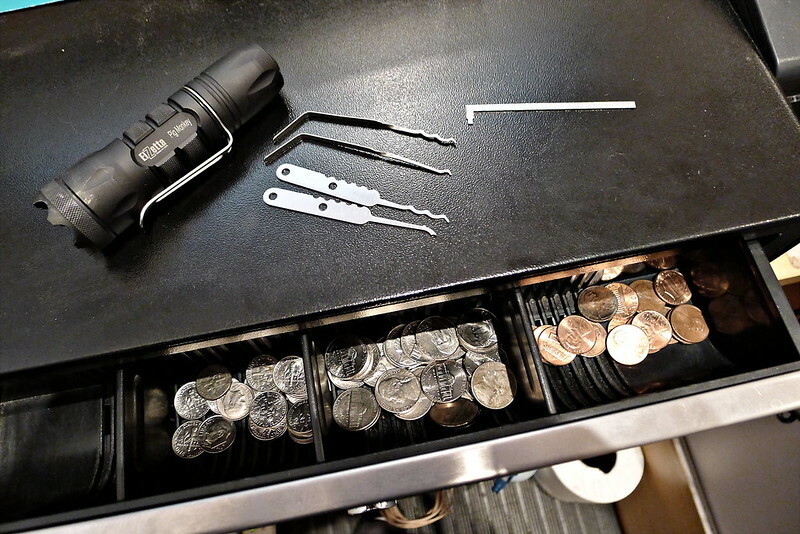 A pair or two would frequently fall behind the back of the drawer, where I would forget about it until I happened to notice that the drawer was no longer closing all the way. Folded this way, everything fits. Immediately upon opening the drawer I can take stock. As with all clothing categories, I have different types of socks and different types of underwear, each more or less appropriate for different applications. A quick glance in the drawer lets me know what I have available, and when it may be time to address the laundry pile. This post was published on 2017-07-01 . It was tagged with books, quote. Triple Aught Design is a small business. All of us wear multiple hats to make things go. Sometimes I end up wearing hats that may be considered odd in other businesses. Today I got a call from our retail store manager. 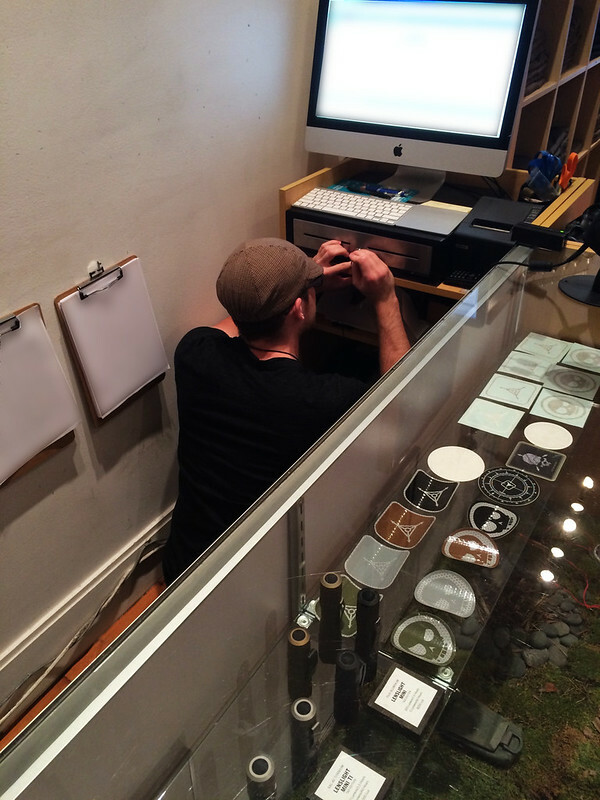 The key for the cash drawer at our Hayes Valley Outpost had been accidentally locked inside the drawer. As the guy generally responsible for security-related things, and the lockpicker in the office, the retail team thought I could help. I’ve carried a set of Bogota picks in my wallet every day for a number of years. The popularity of the Bogota picks is well-deserved, but I found that this particular lock was too small for me to insert both the pick and the tension wrench. Fortunately I just picked up a pair of Kelly Alwood‘s ALS Mini Flats a couple weeks ago, and happened to have those in my pack. I don’t like the picks as much, but the tension wrench has a nice small tip that left me just enough room to insert the single hook Bogota pick. Between the ALS wrench and the Bogota pick I had the drawer opened shortly, and recovered the key. Unfortunately I did not get to keep what was inside. On the wall of the Outpost we have the well-known Heinlein quote, which is something of a driving force for what we do at Triple Aught Design, and struck me as appropriate today. This post was published on 2014-11-02 . It was tagged with gear, edc, lockpicking, quote, triple aught design.